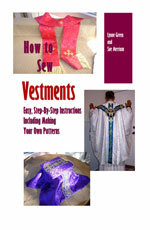 I am a seed beader who wants to create the symbols used on vestments using seed beads rather than embroidery stitches. Has that been done? Would there be a place for that sort of art? thanks for info. I have never seen beading done on a vestment, but I don't know why it couldn't be. There would be an awful lot of labor done, and I don't know if there would be a market for it. I suppose you try. Make one and put on eBay and see how it does. That's how I started my vestment sewing career.